The numbers are in! 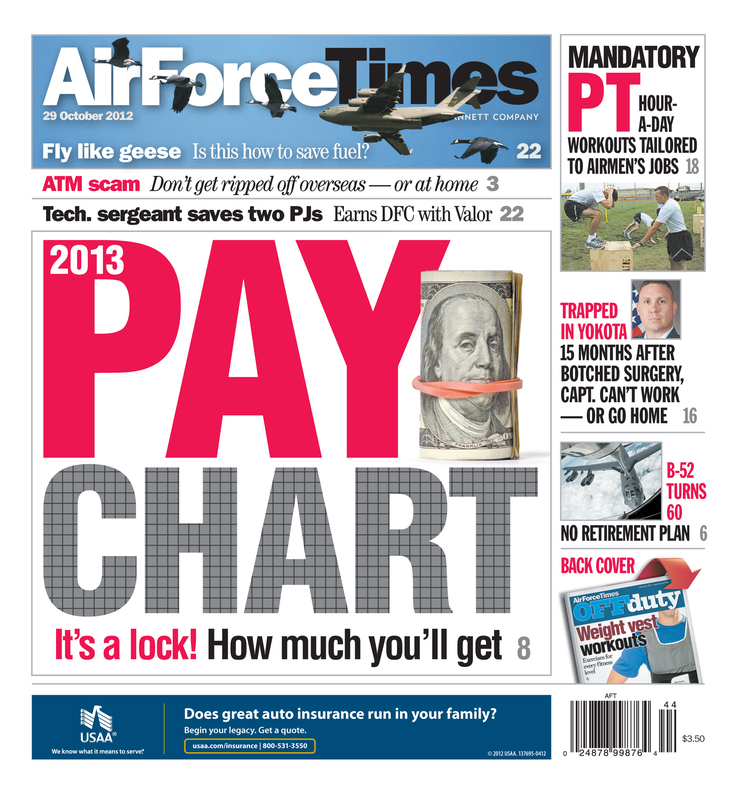 Active-duty troops and reserve component members will be receiving a 1.7 percent pay raise in fiscal 2013 despite budget uncertainties. The 1.7 percent cost-of-living adjustment will also apply to military retirees unless a law is enacted to modify the adjustment, but VA officials have promised that veterans should receive their checks this January. Meanwhile, a group of airmen in Honduras recently had thousands of dollars and their identities stolen through a technological heist called “skimming” — an illegal device installed in ATMs to read credit and debit cards. Skimming has swiped away $1 billion annually from card holders across the U.S., according to OSI. In other news, a captain stationed in Yokota remains in active-duty limbo after his botched knee surgery left him partially immobilized. Capt. John Waldroup has been denied a permanent change of station back to the U.S. even after 15 months passing since the medical mistake. Does the Air Force need to toughen its fitness program? The Air Force overhauled its program in 2010, but airmen training at a naval explosive ordinance unit at Eglin Air Force Base, Fla., may prove to be a role model for the future of PT. There is a Staff Sgt in the Joint Defense Facility Pine Gap in Australia. He has been waiting on his orders to join his family in the US. His family was allowed to leave, but he cannot because his orders have not been processed. He has no job, no quarters, and no orders now for over 4 months, while the Air Force administration can’t get their act together. What kind of administration is that?